For an updated version of this story, click here. 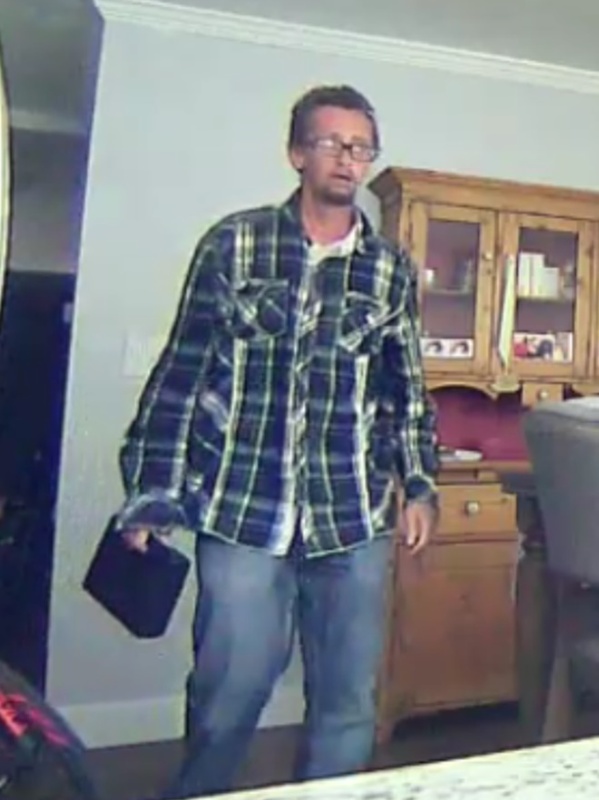 CENTERVILLE, Utah, May 10, 2018 (Gephardt Daily) — Police are asking for the public’s help in identifying the suspect in a residential burglary. A news release from the Centerville Police Department says an unidentified man used a prying device to force his way into an unoccupied home on May 9. The incident happened at about 12:30 p.m.
Once inside, the suspect walked throughout the house, searching room to room through the homeowner’s belongings. Surveillance cameras captured video of the suspect as he walked throughout the home, the news release says. The suspect is described as Caucasian, possibly in his late 30s or early 40s. He was wearing a blue and white flannel long-sleeved button-down shirt, blue jeans and glasses. He appears to have short brown hair and a goatee. The release goes on to say the suspect stole a Taurus 9 mm semiautomatic handgun in a small black case. He also stole a Giant Anthem Advance Pro 1 bicycle. The bike was black, with orange decals. Anyone with information that could help identify this suspect is asked to call Centerville Police Detective D. Davis at 801-677-6427. Anonymous tips are welcome.